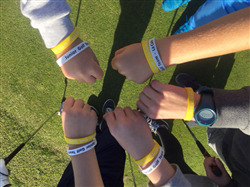 La Cala Resort in Southern Spain is placing a focus on the golfers of the future with an innovative, progressive colour coding bracelet system in their renowned Junior Academy. Staffed by experienced PGA professionals, the La Cala Junior Academy has adopted a colour coding bracelet system for 2018/2019. Young newcomers to the game will begin with the basics and a white bracelet for level 1 and work up through the grades towards the ultimate goal of the black bracelet worn by junior golfers at level 8. The idea of the colour coding bracelet system is to give young golfers a clear path of progression in the early stages of their golfing careers, preparing them to become competent in all aspects of the game and responsible ambassadors for the La Cala Resort and its Golf Academy. At the very outset, kids will receive the white bracelet for level 1, as long as they are federated via the Spanish Golf Federation, when they can hold the club or putter with hands together and thumbs aligned and display a basic general knowledge of the game. Juniors will then work their way up through the bracelet colours – yellow, orange, green, blue, purple, brown and finally black, by displaying their developing skills and an increasing knowledge of the sport. As they move on through the grades, kids will not only learn the technical basics of golf but also gain an understanding of the fundamentals of the sport in terms of equipment and shot-making. They will be given instruction on the rules of the game and guidance on the importance of etiquette and fair play in golf. In addition, juniors at the Academy will be encouraged to improve their physical fitness as they progress, to acquire and then reduce their handicaps and to play in federated tournaments. Moving up through the grades, juniors will be required to pass skills and playing tests, together with rules/etiquette tests, to progress to the next level. The bracelet system is designed to give a full golfing education to young players. By the time they reach level 8 and acquire the black bracelet, they should be fully able to play golf to a competent level (with an official handicap of 35 or less) and to demonstrate knowledge of and respect for the game. For more information on the La Cala Junior Academy and the colour-coding bracelet system please contact the Golf Academy by email at academia@lacala.com or by telephone on (+34) 952 669 037. The La Cala Golf Academy offers lessons and group classes for both beginners and experienced players, with multilingual professionals available to pass on their expertise and teach all levels of golfers through a wide variety of tuition programs.